Moles can appear anywhere on the skin, alone or in groups. Their colors can range from light brown to red, blue, dark brown, gray and even black. They may be flat, slightly raised, smooth, rough and may contain dark hairs. Most moles are referred to as benign nevi and are harmless. The term dysplastic nevus refers to moles that contain abnormal or atypical cells. These dysplastic nevi have a greater potential for becoming a skin cancer. The life cycle of the average mole is about 50 years. Everyone has moles. Over time, they usually enlarge and some may develop hairs. As time passes, moles can slowly change, becoming raised or change color. Some will not change at all. 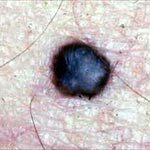 Anyone with a personal or family history of skin cancer should maintain a relationship with their dermatology practitioner for annual monitoring and removal of suspicious moles. It is important to recognize early warning signs such as changes in color, shape, or size of a mole.